The beautiful flowers you see every Sunday at the Altar are provided by YOU and the Altar Flower Ministry. 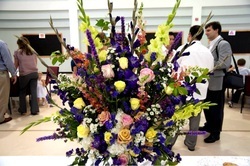 Headed by Mrs. Ann Burton, this ministry is responsible for ensuring that the flowers are ordered and placed on the altar for each worship service. At the end of the service with the help of Altar Guild, these flowers are broken into smaller arrangements and taken to the sick and homebound. Flowers are donated by our parishioners and an acknowledgement for each donation is included in the Sunday bulletin. These dedications can be made in honor or, in thanksgiving for, or in memory of someone. To learn how to dedicate your donation, please select the Altar Flower Ministry box on the "I want to learn more" page. Each Sunday, starting at 7:30am, one of five rotating breakfast teams prepares breakfast for the parish life ready to serve at 9:00am. The members of the Breakfast Team get to choose what to serve. There are groups whose specialties vary from pancakes, to casserole, to hash brown bites. Whatever you decide to make, you get to do the shopping, (but don’t worry the church will reimburse you). Alan Burton makes sure that all the staples are in place, from the bacon and eggs to the orange juice; and Deb DiPuma communicates with all the teams regarding schedule, switches, and any kitchen issues that may arise. For information, please select the Sunday Breakfast Prep box on the "I want to learn more" page. From fresh fruit to home baked muffins to mini cinnamon rolls, the Post Service Coffee ministry provides refreshments following the 10:00am service. This much appreciated snack with coffee and drinks is set-up under the bell on the walkway near the fish pond. Many mill about after the service to enjoy the food and fellowship. Parishioners sign up for this ministry and work on a rotating basis, bringing refreshments, setting up, and cleaning up when it’s done. Toyin Agboola has taken charge of this ministry and would love to have you create a new team or sign-up to join the existing rotation. For information, please select the Post Coffee Service box on the "I want to learn more" page. 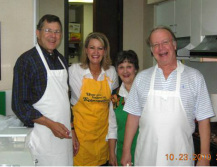 The Parish Life Activities Ministry, under the direction of the Vestry, has dedicated members who organize all of our food oriented events. They ensure that the Parish Hall is set up for upcoming events and plan the menu. 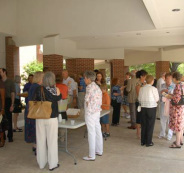 Then come the day of the activity, they provide the food, through catering, baking, or potluck, and drinks, such as refreshing lemonade, coffee, water, and secret recipe homemade punch. This Ministry makes fellowship comfortable and enjoyable, by making things run smoothly, and taking care of us. Carol Goulet, leader of this ministry, is looking for you secret chefs to step forward and offer your culinary skills.